Pasar Lumpur (or Mud Market) is the Indonesian name of a monthly community market in Ledokombo, East Java province, Indonesia. Thanks to our Sustainable Diets for All (SD4All) partner, Tanoker, the term now means much more than just buying and selling. On May 6 2018, more than 1,000 people of all ages – including government representatives, military and different community groups – gathered in the southern area of Ledokombo to celebrate the first anniversary of what has become a celebrated community event. Tanoker initially set up Pasar Lumpur at the request of local children and youth groups interested in learning to play mud polo. Located in a former children’s playground, it eventually became a central place for the community to come together, with Tanoker supporting community needs through training and other fun activities. Mothers cooking healthy food for their growing children started selling their home cooking to increase the family income. At Tanoker’s initiative, more and more community members became involved in Pasar Lumpur each month, offering everything from money and food to vouchers and new equipment. The first anniversary started off with a “healthy walk” competition through the hills and along the river and the rice paddy fields, highlighting the nature and beautiful views of Ledokombo district. 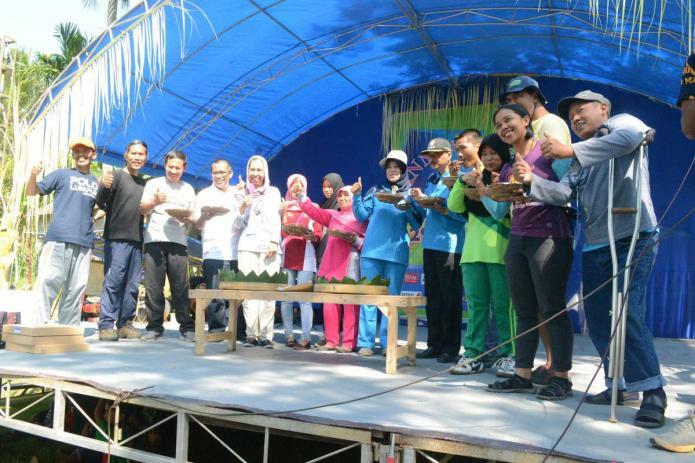 The opening ceremony was led by the Head of Ledokombo sub-district, Suherlan, who cut the traditional yellow rice called tumpeng, accompanied by live music from a local marching band. The Tanoker team performed a traditional East Java stilt dance to welcome all guests and partners, followed by free dancing by participants. During this performance, there were also places where visitors could play traditional games and do other creative activities such as walking on stilts and wooden boards, walking on coconut shell stilts, jumping rope, tug of war, etc. The celebration ended with a pillow fight and mud polo competition. Everyone actively participated and left for home laughing and feeling good. You can see photos of typical Pasar Lumpur activities here. One of the goals of the Hivos Sustainable Diets for All program is to work with citizens and partner organizations to promote diets which are diverse, healthy, fair and green.